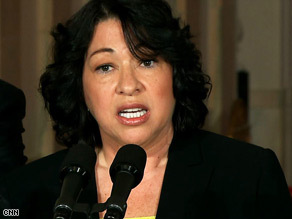 WASHINGTON (CNN) -- As Supreme Court hopeful Sonia Sotomayor breaks ground for Hispanics, she is poised to add an exclamation point to another historic demographic shift: the move to a Catholic court. If confirmed, Sonia Sotomayor would be the sixth Catholic justice on the U.S. Supreme Court. "It's most unusual," said Barbara Perry, a government professor at Sweetbriar College who was already writing a book about Catholics on the Supreme Court when Sotomayor was named as the next nominee. "Presidents used to reserve a Catholic seat and a Jewish seat on the Supreme Court," Perry told CNN Radio. "Now we've moved from a Catholic seat on the court to a Catholic court." Of the 110 people who have served on the Supreme Court, 11 have been Catholic. Five of those justices -- Samuel Alito, Anthony Kennedy, Antonin Scalia, Clarence Thomas and Chief Justice John Roberts -- are currently on the court. "It is more than a random selection process that yielded the current five Catholics on the bench," Perry said. The five current Catholic justices were appointed by Republican presidents, which Perry notes may be a key reason why so many Catholics have joined the high court in recent years. "It's their tie to conservative Catholicism which made them agreeable to (Republican) presidents' ideology," she said. Perry sees Catholics as swing voters with a base of socially conservative principles, and therefore naturally attractive for Republican presidents. Catholic League President Bill Donohue goes further, hypothesizing that Catholics have conservative credentials on issues such as abortion, without the political baggage of terms such as the "religious right" or "evangelicals." "Is it safer to nominate a Catholic as opposed to an evangelical to get votes? I think the answer is decidedly yes," Donohue said. Donohue also suggests the vigorous education in Catholic schools during the 20th century produced sharp legal minds. "I think there might be a certain kind of Catholic edge, so to speak, as a residual property of a Catholic education," he said. Underlying causes aside, Perry sees the fast shift as a sign that centuries of American concern about Catholics are over. In 1985, a lone Catholic justice, William J. Brennan, Jr., sat on the court. A generation later, that number is poised to become six. "What that tells is that in our politics, religion doesn't matter anymore," Perry said. Then she added: "I don't think our politics are ready for an Islamic justice at this point." Court observers wonder what, if anything, six Catholic justices would mean for Supreme Court decisions. The five Catholics currently on the bench concurred in a 2007 decision, Gonzales v. Carhart, which upheld a state ban on late-term abortions. "I think she's more reliably liberal," Donohue said. Donohue said he still would like to see Sotomayor join the bench. "Even though I'm a conservative and she is not, there's still a certain way that you do root for the home team," he said.